Lock in a great price for Kastello Guesthouse – rated 9.6 by recent guests! Fantastic location, excellent accommodation and service, attention to detail from decoration to hotel amenities and breakfast! The location is great, right into historic center of Nafplion, and close to the shopping and restaurants area. Rooms are comfortable, trendy, clean. Breakfast is great. Konstantin is very helpful. Arvantia Beach is just 3 min walk, and you do not need anything else for a short stay. We'll certanly go there again. It was the best experience ever, because of the receptionist, Konstantinos (? I hope this is his name). He is the most friendly person that we ever met at a hotel, he gave us good tips about what to do in Nafplio and even what to do in Athens. Room was really nice, I loved the way it was decorated and the bed is super comfortable. Kostantinos was amazing — friendly, helpful and so positive! The hotel is perfectly located for a stay in Nafplio and the surrounding area. The round-trip bus to Mycenae and Epidaurus is right around the corner. Location was perfect, the hostess was very nice. The room size was good. The hotel was in an excellent location. The suite was spacious and well-decorated. The bed was comfortable. We had our own router so the wi-fi was great. We dealt with Helen throughout and she was extremely helpful with everything. Breakfast was great with lots of variety, including fresh-squeezed orange juice. We had a view of the castle from our balcony. There were a lot of good restaurants nearby. Our family room was very spacious, the staff was extremely helpful and welcomed us warmly. The location is perfect. Wi fi was excellent. Great little hotel! Kastello Guesthouse This rating is a reflection of how the property compares to the industry standard when it comes to price, facilities and services available. It's based on a self-evaluation by the property. Use this rating to help choose your stay! One of our best sellers in Nafplio! Housed in an old mansion, Kastello Guest house features elegant accommodations . It is located in one of the scenic alleys of Nafplio, between Syntagma Square and the starting point for climbing to Palamidi Castle. Individually decorated, all blend a romantic décor with modern facilities. Fitted with wooden floors and hand-picked items, they include air conditioning, a flat-screen TV and mini-bar. Bathrobes, slippers and a hairdryer are provided. Within 1,000 feet from Kastello, you can reach the Archaeological Museum of Nafplio, as well as the seaside promenade. Traditional taverns and charming cafes can be found within a short walk. 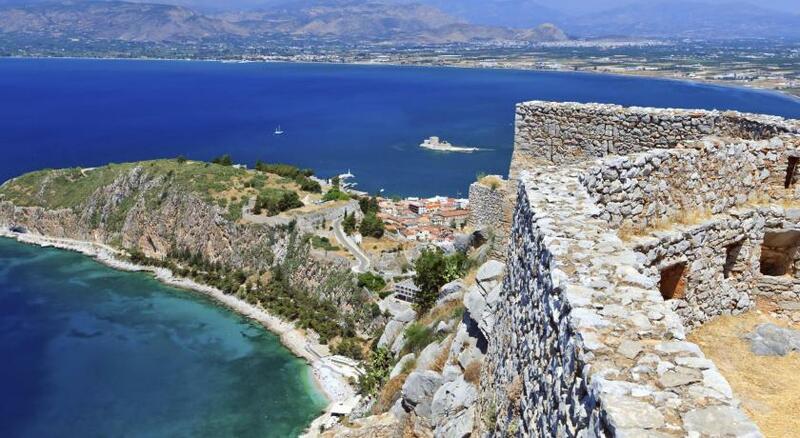 This property also has one of the top-rated locations in Nafplio! Guests are happier about it compared to other properties in the area. This property is also rated for the best value in Nafplio! Guests are getting more for their money when compared to other properties in this city. When would you like to stay at Kastello Guesthouse? Blending a romantic décor with modern facilities, this room is fitted with wooden floors and hand-picked items. It includes air conditioning, a flat-screen TV and mini-bar. Bathrobes, slippers and a hairdryer are provided. Please note that this room type cannot accommodate children for safety reasons. This suite has a seating area, air conditioning and bathrobe. House Rules Kastello Guesthouse takes special requests – add in the next step! Kastello Guesthouse accepts these cards and reserves the right to temporarily hold an amount prior to arrival. Please inform Kastello Guesthouse of your expected arrival time in advance. You can use the Special Requests box when booking, or contact the property directly using the contact details in your confirmation. It can get a bit noisy depending on the other guests occupying the upper rooms. The manager, Konstantinos, was an excellent host! He was friendly and helpful and ensured that we had a wonderful breakfast every day and then set off with a sightseeing plan so that we didn’t miss the special sights of Nafplio. The guesthouse is in a great location on the edge of the old town. It is easy walking to all of the interesting parts of the town. The bed was very comfortable and the room was spacious, although the bathroom was a little small. the building, the owner, the service the accessories that came with it! Lovely loft room with fantastic views from the roof terrace. Really friendly staff/owners. Spacious room with sofa, arm chair, dresssser, and large bed. It’s In the center where you can reach the bus terminal in 1 min. Room uses a card key which I felt secure. Staff was super nice and kindly allowed my late check out. The accommodation is nice and as shown in the description. Centrally located. The very friendly host has done everything for the pleasant stay we had. We really enjoyed the delicious breakfast, especially the fresh orange juice. Great location,very good internet,friendly owners. Highly recommend. The location is brilliant - the guesthouse is between the old and new parts of the town, as well as close to the sea. And we received such a warm welcome when we arrived! All the staff were super. Bathroom is a bit outdated.